"Nesimi" redirects here. For places in Azerbaijan, see Nəsimi (disambiguation). This article is about the 14th-century Sufi poet. For the 17th-century Alevi-Shi'a poet, see Kul Nesimi. ‘Alī ‘Imādu d-Dīn Nasīmī (Azerbaijani: Seyid Əli İmadəddin Nəsimi عمادالدین نسیمی, Arabic: عمادالدین نسیمی‎‎), often known as Nesimi, (1369 – 1417 skinned alive in Aleppo) was a 14th-century Azerbaijani or Turkmen Ḥurūfī poet. Known mostly by his pen name (or takhallus) of Nesîmî, he composed one divan in Azerbaijani, one in Persian, and a number of poems in Arabic. He is considered one of the greatest Turkic mystical poets of the late 14th and early 15th centuries and one of the most prominent early divan masters in Turkic literary history (the language used in this divan is the same with Azerbaijani). Nesîmî's birthplace, like his real name, is wrapped in mystery: some claim that he was born in a province called Nesîm — hence the pen name — located either near Aleppo in modern-day Syria, or near Baghdad in modern-day Iraq, but no such province has been found to exist. There are also claims that he was born in Shamakhi-which is mostly likely because his brother is buried in Shamakhi, Azerbaijan. an early Ottoman poet and mystic, believed to have come from Nesīm near Baghdād, whence his name. As a place of this name no longer exists, it is not certain whether the laqab (Pen-Name) should not be derived simply from nasīm zephyr, breath of wind. That Nesīmī was of Turkoman origin seems to be fairly certain, although the Seyyid before his name also points to Arab blood. Turkic was as familiar to him as Persian, for he wrote in both languages. Arabic poems are also ascribed to him. Death of Nisimi by Azim Azimzade. From his poetry, it's evident that Nesîmî was an adherent of the Ḥurūfī movement, which was founded by Nesîmî's teacher Fażlullāh Astarābādī of Astarābād, who was condemned for heresy and executed in Alinja near Nakhchivan (Azerbaijan). The center of Fażlullāh's influence was Baku(Azerbaijan) and most of his followers came from Shirvan (Azerbaijan). Nesîmî become one of the most influential advocates of the Ḥurūfī doctrine and the movement's ideas were spread to a large extent through his poetry. While Fażlullāh believed that he himself was the manifestation of God, for Nesîmî, at the center of Creation there was God, who bestowed His Light on man. Through sacrifice and self perfection, man can become one with God. Around 1417, (or possibly 1404) as a direct result of his beliefs — which were considered blasphemous by contemporary religious authorities — Nesîmî was seized and, according to most accounts, skinned alive in Aleppo. 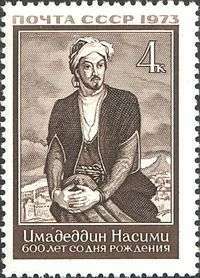 Portrait of Imadeddin Nasimi by Azerbaijani artist Chingiz Mehbaliyev in Hungarian stamp. His work consists of two collections of poems, one of which, the rarer, is in Persian and the other in Turkic. The Turkic Dīwān consists of 250-300 ghazels and about 150 quatrains, but the existing mss. differ considerably from the printed edition (Istanbul 1298/1881). No scholarly edition has so far been undertaken, but a study of his vocabulary is given by Jahangir Gahramanov, Nasimi divanynyn leksikasy, Baku 1970. The Persian Dīwān has been edited by Muhammad Rizā Mar'ashī, Khurshid-i Darband . Dīwān-i Imād Dīn Nasīmī, Tehran 1370 Sh./1991. The poem serves as an excellent example of Nesîmî's poetic brand of Hurufism in its mystical form. There is a contrast made between the physical and the spiritual worlds, which are seen to be ultimately united in the human being. As such, the human being is seen to partake of the same spiritual essence as God: the phrase lâ-mekân (لامکان), or "the placeless", in the second line is a Sufi term used for God. The same term, however, can be taken literally as meaning "without a place", and so Nesîmî is also using the term to refer to human physicality. In his poem, Nesîmî stresses that understanding God is ultimately not possible in this world, though it is nonetheless the duty of human beings to strive for such an understanding. Moreover, as the poem's constant play with the ideas of the physical and the spiritual underlines, Nesîmî calls for this search for understanding to be carried out by people within their own selves. This couplet has been described in different pictures, movies, poems, and other pieces of arts. I called Fâ, Zâd, and Lâm by the name "Truth"
In the quatrain's last line, "Fâ", "Zâd", and "Lâm" are the names of the Arabic letters that together spell out the first name of the founder of Hurufism, Fazl-ullah. As such, Nesîmî is praising his shaykh, or spiritual teacher, and in fact comparing him to God, who is also given the name "Truth" (al-Haqq). Moreover, using the Perso-Arabic letters in the poem in such a manner is a direct manifestation of Hurûfî beliefs insofar as the group expounds a vast and complex letter symbolism in which each letter represents an aspect of the human character, and all the letters together can be seen to represent God. Should you want to veil your face from me, oh please do not! Should you want to make my tears flow, oh please do not! And leave your lover destitute, oh please do not! Nesîmî is venerated in the modern Republic of Azerbaijan, and one of the districts of the capital city, Baku, bears his name. There is also a monument to him in the city, sculpted by T. Mamedov and I. Zeynalov. Furthermore, the Institute of Linguistics at the Academy of Sciences of Azerbaijan is named after him, and there was also a 1973 Azerbaijani film, Nasimi (the Azerbaijani language spelling of his name), made about him. The 600th anniversary of Nesîmî's birthday was celebrated worldwide in 1973 by the decision of UNESCO, and representatives from many countries took part in the celebrations held both in Azerbaijan and in Moscow, Russia. The movie dedicated to the poet Nesimi by Azerbaijanfilm studio. The Nasimi Institute of Linguistics is part of the Azerbaijan National Academy of Sciences. There is a urband district (raion) in Baku. A Baku metro station is named Nəsimi. There are Nəsimi streets in Agdjabedi, Khudat and Baku. There are villages named Nasimi in Bilasuvar and in Sabirabad regions, as well as Nəsimikənd in the Saatly region of Azerbaijan. The oldest poet of the Azeri literature known so far (and indubitably of Azeri, not of East Anatolian of Khorasani, origin) is ʿEmād-al-dīn Nasīmī (about 1369-1404, q.v.). 1 2 Baldick, Julian (2000). Mystical Islam: An Introduction to Sufism. I. B. Tauris. p. 103. ISBN 1-86064-631-X. 1 2 3 Burrill, Kathleen R.F. (1972). The Quatrains of Nesimi Fourteenth-Century Turkic Hurufi. Walter de Gruyter GmbH & Co. KG. ISBN 90-279-2328-0. 1 2 Lambton, Ann K. S.; Holt, Peter Malcolm; Lewis, Bernard (1970). The Cambridge History of Islam. Cambridge University Press. p. 689. ISBN 0-521-29138-0. ↑ Jo-Ann Gross, Muslims in Central Asia: expressions of identity and change, (Duke University Press, 1992), 172. Andalib also wrote several mathnavis, the most famous of which is about the life of the fourteenth-century Azerbaijani mystic Nesimi. ↑ The Celestial Sphere, the Wheel of Fortune, and Fate in the Gazels of Naili and Baki, Walter Feldman, International Journal of Middle East Studies, Vol. 28, No. 2 (May, 1996), 197. ↑ Walter G. Andrews, Najaat Black, Mehmet Kalpaklı, Ottoman lyric poetry: An Anthology, (University of Washington Press, 2006), 211. ↑ Safra, Jacob E. (2003). The New Encyclopædia Britannica. Encyclopædia Britannica. p. 60. ISBN 0-85229-961-3. The second tradition centred on Azeri, the literary language of the eastern Oğuz in western Persia, Iraq, and eastern Anatolia before the Ottoman conquest. 1 2 3 4 5 Andrews, Walter G.; Black, Najaat; Kalpakli, Mehmet (1997). Ottoman Lyric Poetry: An Anthology. University of Texas Press. pp. 211–212. ISBN 0-292-70472-0. 1 2 Devellioğlu, Ferit (1993). Osmanlıca-Türkçe ansiklopedik lûgat: eski ve yeni harflerle. Ankara: Aydın Kitabevi. pp. 823–824. ISBN 975-7519-02-2. 1 2 3 Cengiz, Halil Erdoğan (1972). Divan şiiri antolojisi. Milliyet Yayın Ltd. Şti. p. 149. ↑ Mélikoff, Irène (1992). Sur les Traces du Soufisme Turc: Recherches sur l'Islam Populaire en Anatolie. Editions Isis. pp. 163–174. ISBN 975-428-047-9. ↑ Turner, Bryan S. (2003). Islam: Critical Concepts in Sociology. Routledge. p. 284. ISBN 0-415-12347-X. ↑ Kuli-zade, Zümrüd (1970). Хуруфизм и его представители в Азербайджане. Baku: Elm. pp. 151–164. ↑ Safarli, Aliyar (1985). Imadəddin Nəsimi, Seçilmis Əsərləri. Baku: Maarif Publishing House. pp. 1–7. ↑ Minorksy, Vladimir (1942). "The Poetry of Shah Ismail". Bulletin of the School of Oriental and African Studies, University of London. 10 (4): 1053. doi:10.1017/S0041977X00090182. ↑ Aslanoğlu, İbrahim (1992). Şah İsmail Hatayî: Divan, Dehnâme, Nasihatnâme ve Anadolu Hatayîleri. Der Yayınları. p. 523. ↑ The phrase is in some ways redolent of the earlier Sufi Mansur al-Hallaj's statement "ana al-Haqq" (أنا الحق), which means literally "I am the Truth" but also — because al-Haqq is one of the 99 names of God in Islamic tradition — "I am God". ↑ This device of employing double, and even completely opposite, meanings for the same word is known as tevriyye (توريه). ↑ "ChingizArt: Colors dedicated to Nesimi". Youtube.com. 2010-01-18. Retrieved 2013-05-20.